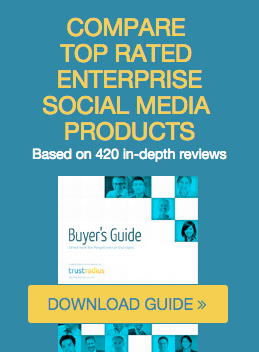 Austin Texas, October 22nd, 2013 - TrustRadius, the leading site for business software advice, has today announced the first edition of its Buyers Guide for Social Media Management Software (SMMS), based upon in-depth user reviews of 36 different SMMS products. TrustRadius is an online community where professionals share in-depth insights about business software through structured product reviews and networking. All reviewers are authenticated and every review vetted for balance, clarity and completeness before publishing. The SMMS Buyers Guide, which can be downloaded for free here (no registration required), summarizes key insights directly from in-depth product reviews by professionals who purchase, implement and use social media management software. Enterprise scalability – the need from many larger, complex organizations for enterprise functionality like workflow for teams. Mobility – a desire to access SMMS products via mobile devices. Usability – SMMS users place a high emphasis on usability/ user interface. Integration – capabilities to tie to other systems including CRM and analytics. Acquisition risk/ impact - while acquisitions can bring integration benefits, they can also alter product direction. 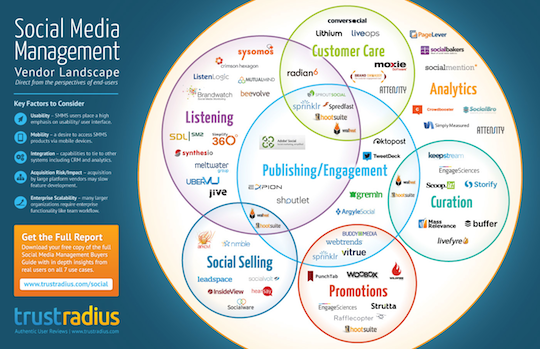 Rishi Dave, Executive Director, Digital Marketing, Dell, said: “The SMMS Buyers Guide and Infographic from TrustRadius really simplifies the complex landscape of Social Media Management tools available to an enterprise”. TrustRadius is the leading site for business software users to share real-world insights through in-depth reviews and networking. We help users make better product selection, implementation, and usage decisions. Every reviewer is authenticated and every review vetted before publishing. Unlike simple rating sites, TrustRadius reviews are structured and substantive, averaging more than 500 words. Reviewers can also update their reviews to keep them current. Reviews are curated into product comparisons and buyer’s guides. Founded by successful entrepreneurs and backed by the Mayfield Fund, TrustRadius is bringing transparency and efficiency to the $3.7 trillion business technology market.